We always give a food type gift to our mailmen (there are two), UPS man and the lady at the post office (she is a real sweetie) plus our trash pickup guys. So anyway I always add on a thing of candy canes. 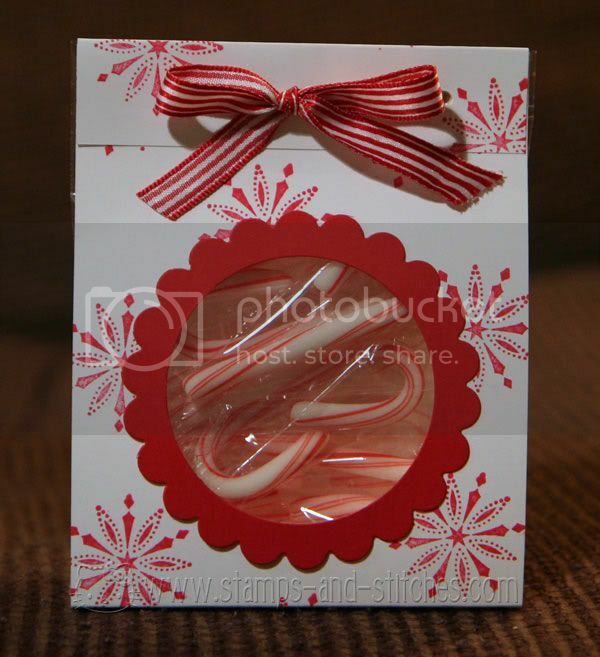 I usually just put the candy canes in a cellophane bag, make a patterned paper topper, and staple it on. Boring. This year I wanted to make something using some of my stuff that I just HAD to have. So I made these very simple, yet not as simple as usual, candy cane treat holder things. I used my nestabilities, big shot, scor-pal, stamps and ribbon. I think they look cuter than my usual ones. Stamp, real red ink and cardstock (whisper white and real red) from Stampin' Up. Also used nestabilities plain and scalloped circle and the scor-pal for all the scoring. The ribbon is from somewhere that I can't remember. Probably Walmart. Also a magnetic mat (for the nestabilities) came in very handy for this project. Too freakin' cute!! Love the idea! This is adorable. It looks so professional. You are so nice to give goodies to them. I should do that more but I don't know any of the people that do that stuff for us. It would be nice to though. Very very cool! Brilliant idea. How cute is this! Your mailman will love this gift! This is so pretty and fun! I'm sure they must appreciate this so much- very thoughtful! Oh my gosh...what a great idea! I love this and they will, too! Oh, now why didn't I think of something like this for my mailman? This is really great! Merry Christmas. Very cute! I'm sure they loved it!